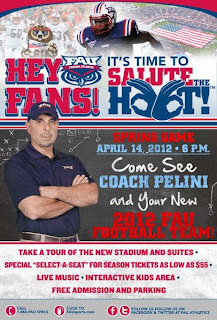 FAU Sports Informer: FAU's Spring Fling! The term "Football in Paradise" could not be more appropriate for the Spring game that is set to be played by the Owls Football team on April 14 at 6pm. Pelini has been hard at work for the past 5 months in preparing his players to represent FAU in the way everyone is hoping for. While Spring games are a large hit at other college campuses, the Owls are hoping to attract many students, fans, and the people in the community to come out and get a sneak peek of what's to come for the Fall! 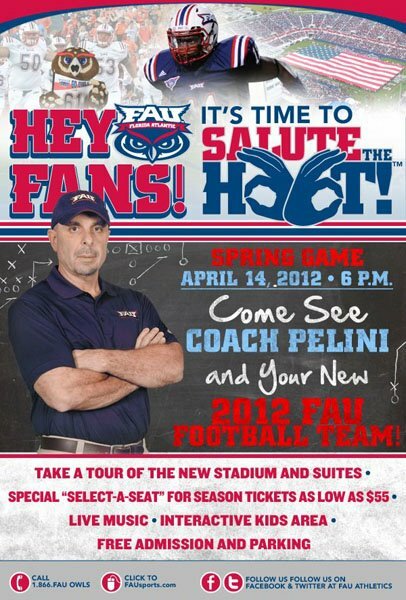 Pelini has brought in many new players who are challenging the veterans for their spots, so this game will hopefully put the pressure on the Owls to prove themselves to the coaches, the University, and all FAU fans in attendance. While the QB situation has been one that has been of great uncertainty for the players and fans, it seems that Wilbert will be the starter for the Spring game. Which seems ironic considering he was the only palyer who had little to no experience in the spread offense. It will defenitely be something to pay attention to, and for us Owl fans to look forward to! While Spring football is of great importance, Spring is also the time for baseball, and our Owl team has leaped burrows in proving that they are competable not only in the Sun Belt, but also on a National level, holding a record of 20-10, ranking 30th in this week's Collegiate Baseball NCAA Division 1 poll. The Owls pulled off a ninth inning victory on Wednesday, April 3 against hometown rival Lynn University. As the Owls continue to make strides to jump into the top 25 rankings, the crowd presences has been positive for the Owls and we can expect it to continue to grow as the FAU baseball team gives their fans something to cheer about!